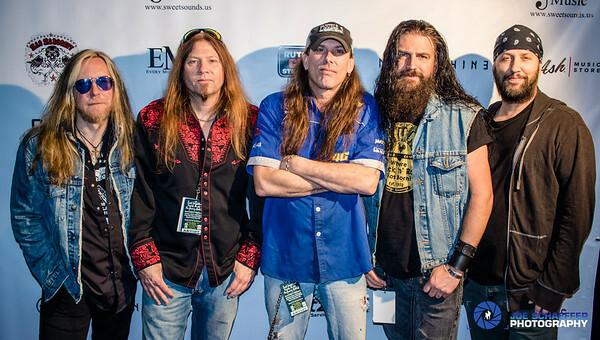 The band are Rick Ruhl on vocals, Travis "Gunner" Butler and John Guttery on guitars, Lonnie Hammer on drums and Troy Fleming on bass. NI ROCKS – Hi Rick, thanks for taking some time to talk to Rock Radio NI. 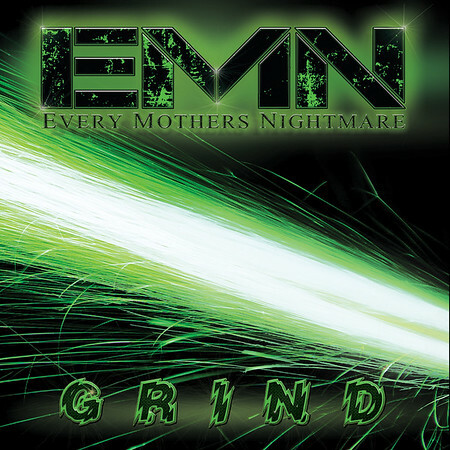 Every Mother’s Nightmare release their album “Grind” on 6th October. We just played the track “Loco Crazy” which was originally released on an EP in 2015. Tell us something about that track. RICK – That track was sort of an experiment. I was working with producer Justin Rimer, who I’d been wanting to work with as I was really digging what he was doing – his style of recording. I’m kinda old school – grip it and rip it rock n roll stuff. He has a new twist. Went to the studio and wrote “Loco Crazy” and recorded it, just to see how it would turn out. And it turned out great. I’m very, very happy with it – mixing old school with new school gave it a little twist. NI ROCKS - The new album contains 8 studio tracks and 3 live tracks. Where were the studio tracks recorded and who did you work with for production etc? RICK – All the studio tracks were done with Justin Rimer at Cross Trax Studios here in Memphis, Tennessee. He’s a great producer. He’s done a bunch of more local stuff, but he’s up and coming. NI ROCKS – And the live tracks, where and when were those recorded? RICK – We did those a couple of months ago. The band Tora Tora – we did a benefit for their bass player who was having some problems. They did a benefit for him and recorded and videoed it. We listened back to it and usually when you do a board mix it’s horrible, but it was pretty good and we saw the video stuff. We thought we’d throw a few older songs on there and the live ones were good so we stuck them on there just to give it a little extra something (laughs). NI ROCKS – It’s been 15 years since the last album was released in 2002. Has the band been active throughout that period or was there a long down-time at some point? RICK – That whole period I maybe took two years off. I did some lesser known records I’ll say on some independent labels here and there. I did a lot of stuff myself and I kept going. Music is cantankerous and you just got to ride the high spots and ride the low spots. NI ROCKS – There have obviously been a lot of line-up changes since the first album in 1990. Who do you have in the band with you now? RICK – On bass I have Troy Fleming who has been with me for about twenty years. On guitar I’ve Travis "Gunner" Butler and on the other guitar, a utility man John Guttery, a great guitar player. And on drums Lonnie Hammer. NI ROCKS – As I mentioned earlier there was an EP released in 2015 and those 5 tracks are included on the album. Had that EP a long time in planning or what made the time right to get in the studio at that time? RICK – When I took that two years off, I had a couple of guys in the old band who were leaving to pursue family stuff. I got together with Travis and Lonnie and we started rehearsing a little bit. We played three or four old songs and we just decided right then to write a record. We started writing a little five song EP and we put that out, selling it out of the trunk of a car. Bill Chavis from HighVol heard it and I’ve known him for years; he’s a good friend of mine. He called me and said let’s do a whole record and I said let’s do it! (laughs). NI ROCKS – We’ll play another track from the new album now. Do you want to pick one and tell us something about it? RICK – “Snake” – that’s my love song to my girlfriend that was mean to me! (laughs). NI ROCKS – Every Mother’s Nightmare had early success in the 90’s with two album released through the Arista label. What are your own personal highlights from that period? RICK – Oh man, just about everything! We went from four guys from Tennessee living in a store-all unit to being able to go around the country playing and doing videos. Clive Davis (Arista) came down and signed us and he signed some pretty major people. Just about everything from that point has all been good or a learning experience. So I just chalk it up as all good. NI ROCKS – With the changing music scene, there was a seven year gap between the second album with Arista and the release of “Smokin Delta Voodoo” in 2000. How difficult was it to keep going through that period? RICK – That was probably the roughest part because that’s when music really took a turn. Grunge was more serious music to me and more real. The record label and everybody we were dealing with; all they wanted was “Love Can Make You Blind” which was fine for what it was because back in the day you had to have a ‘ballad to be valid’ as they said. So it was just a battle. We were out on the road at the time, watching music change and we were writing songs trying to go with what we were seeing and they weren’t wanting it. So it was pretty rough. It’s hard when someone tells you you’re not writing right or writing in the right vein. To me it’s all gut and all feel anyway. If it comes from your gut and your heart it can’t be wrong (laughs). NI ROCKS – Probably a stupid question, but do you think those albums released through Perris are under-rated just because they came out in a different era? RICK – Yeah, I think we were lumped in a category...I never considered ourselves and I think everybody was considered as a hair band or a ballad band back then. If they had have come out at a different time I don’t know what would have happened. NI ROCKS – Do you own the rights for those albums now? RICK – No, the only things that I really own..everything from the second record out I’ve tried to keep in my possession. NI ROCKS – Would you think of re-releasing them? RICK – There has been talk of it. We’ve been talking about getting the rights to it. That’s some of the reason why we’re doing some of the older songs live. The new band has a much different feel than the old band. We were just at the right place at the right time back in ‘89. We had played about thirteen shows and all of a sudden we had a big fat record deal. It was a big jump for us. NI ROCKS - The new album is released on 6th October. There are a total of 8 studio tracks. Were those tracks written over a number of years and who is involved in writing the tracks? RICK – They were all written right here. We always practice two or three times per week when we’re home and usually one of those nights is a writing night. We just gather up ideas. Everything is pretty much from the ground up – it’s all pretty new. Some of them we’ve played maybe six times live. NI ROCKS – Is there a standard formula for song writing or do they all come together differently? RICK – Usually we’ll be sitting there and someone will play a good riff or something. It just kind of comes in then and kinda tells me what it’s about. I just go with it. Some songs come in fifteen minutes and some come in fifteen months (laughs). NI ROCKS – Have you more tracks written for another album or have you not started that yet? RICK – We’ve got three in the works; two that we had before “Grind” that we’ve re-vamped because it’s stuff that we’re really diggin! They were never really finished, but the ideas we really liked. We’ve probably got five ready to go if we had about three weeks to sit and wood shed them. NI ROCKS – We’ll play another track from “Grind” now. Do you want to pick one and tell us something about it? RICK – Let’s play “Blown Away”. I wrote that song when my best friend passed away a little over a year ago. All the stuff in the song is pretty much stuff we were sitting looking out his window talking about. That’s my homage to him. NI ROCKS – You’re from the Tennesse area I believe. What were your musical influences when you started with Every Mother’s Nightmare? RICK – My ultimate influence, when I was six or seven years old my mum took me to the Alice Cooper “Welcome to My Nightmare” tour. That was my first and I got blown away by how big that show was and how theatrical and stuff. My uncle worked for Charlie Daniels for twenty nine years and I grew up listening to Marshall Tucker and Elvin Bishop, plus Skynyrd, Kiss, Van Halen and everything. If it’s good it’s good! NI ROCKS – And what do you find yourself listening to these days? RICK – I’m really into Hell Yeah – they’re very good. That’s probably what I’m listening to the most lately. NI ROCKS – Do you find yourself mainly listening to older bands or do you listen to a lot of newer stuff? RICK – Back in the day, as I was saying earlier, you kinda got pigeon holed to having to listen to one specific thing. But with the internet you can find great stuff everywhere. I just like finding something good and heart-felt or whatever. I’m into to anything like that. It doesn’t matter if they’re old or young. NI ROCKS – A couple questions I always like to ask guests on the Show – although you’ve probably answered one of them. Can you remember the first gig you went to and what was the last one you went to? NI ROCKS – And in a similar vein – the first album you bought and the most recent? RICK – The first album I bought was “Welcome to My Nightmare” and after that I got “Schools Out”. The last one I bought was an old record – Zakk Wylde’s “Book of Shadows”. NI ROCKS – As we’ve said the new album is released next month. What plans does the band have to tour in support the album, and any chance that you might make it over to Europe? NI ROCKS – So next summer sometime for Europe maybe? NI ROCKS – Looking ahead 12 to 18 months, what plans do you and the band have and what would you hope to have achieved by the end of that time? RICK – I’d just like to go out and play in front as many people as we possibly could. I’ve been having a great time. We played with Powerman 5000 the other night. Just go out and play and hopefully have enough energy to push out another record; and try not to die between now and then (laughs). NI ROCKS – Any timeframe on the next record? When might that be? RICK – Shoot, I don’t know. I think we’re going to start as soon as we go out and have our next little break. We’ve already got, as I said, a few songs, so as soon as we get a break we can jump in the studio and wood shed for a day or three and then go ahead and start recording. I’m hoping that next year we’ll have something as least about ready to come out. NI ROCKS – I have to say, the new album is excellent. I really love it. I’ve been playing it the last few days and it’s good stuff. RICK – Thanks man, I appreciate that. It’s just rock n roll! NI ROCKS – Rick, that’s all the questions I have for you. Thanks for taking the time to talk to me. Before we finish though I’ll get you to pick another track from the album to play. RICK – Thank you. Let’s go with “Swing Again”.